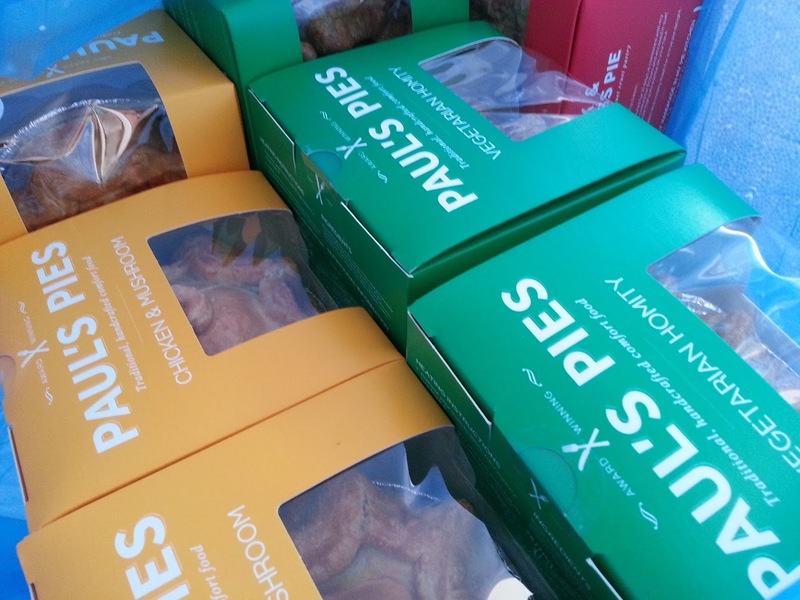 The lowdown on what happened at the first ever Pierate Pie Contest. Following the pie contest overview, a summary of all the pies and the pie contest video, the final post reviews the Paul’s Pies “Wild Venison and Mushroom” pie sampled on the night at the contest but then eaten in full the next day for this review. 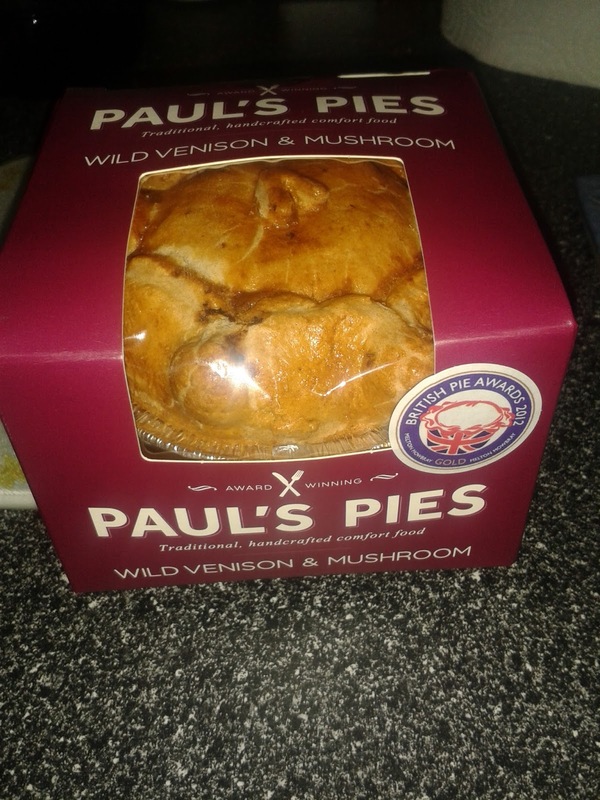 There was no denying that the first ever Pierate Pie Contest kicked off in style with a main course of Paul’s Pies. With a selection of Wild Venison and Mushroom, Steak and Guinness, Chicken and Mushroom and Veggie Homity pies, there was certainly no lack of pie to whet the ap-pie-tites of the guests. Comments the guests made included “awesome pies”, “best pies I’ve eaten” and “pie-fection”. In fact, the main challenge was to remind people to leave some room as there were plenty more pies to come later in the evening! But after the pie contest had come and gone, and the hall was returned to normal, there was one pie which had intentionally been left for a full review. And after all that pie on the Friday night, what else was Pierateer RAS going to eat on Saturday than another pie?! So with the Paul’s Pies Wild Venison & Mushroom pie removed from its lovely purple box and heated in the oven, it was time to give the full pie a review. The condition and colour was brilliant and golden, with the Suet pastry glimmering and the trademark spikes nice and crisp. Cutting through the reasonably thick pastry, the contents slowly oozed out but you can tell from the photo it was well packed to capacity. In fact, you could see why the pastry needed to be quite thick to hold it all in, but fortunately the pastry wasn’t too overpowering. The content was very good, with a nice rich venison flavour complimented well by the mushroom, onion and gravy. 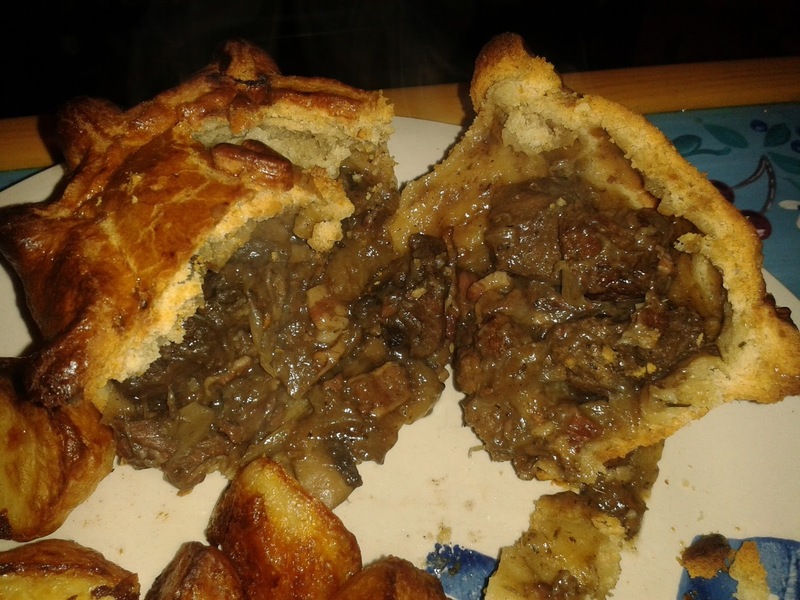 There were certainly some good, meaty chunks of venison throughout the pie, though slightly over packed with alternative content. At £3.75 this is a pretty reasonable price for a pie of clear quality. The ingredients were top quality and certainly worth another delivery! Thanks to Paul’s Pies for providing them for us.